It is the last weekend of Winterlude this weekend and there are tons of great activities like tube sliding, zip lining ($), introduction to Downhill Skiing and Snowboarding, Indigenous Performances and a Circus Area. Preschool Playdates at Billings Estate National Historic Site from 10am to 11am. Enjoy a morning of discovery with your preschooler and explore different themes in local history through play and hands-on activities at the museum. Registration is required. Ages: 3 to 5 years old. Cost: $6.65 per child. Icecade on Sparks Street from noon to 6pm. Try your mitts at classic carnival games with a chilly twist. Enjoy a warm beverage as you lounge, toss, throw, or shuffle! Parents Night at My Gym Ottawa from 5:30 to 8:30. Cool Science Saturday at the Canada Science and Technology Museum from 9am to 5pm. Join them for a fun-filled day showcasing the coolest science in town. Demonstrations, experiments, workshops, and the challenges of cold weather exploration are all part of the day-long family experience. February may be the coldest month, but it’s the COOLEST day at the Museum! Racetime Tour at Jacques Cartier Park from 9am to 4pm. Take out your toque and mittens and come out to play with your favourite characters from Racetime and Snowsnaps! A group of entertainers will be on site to encourage you to participate in some exciting games, and you will even have a chance to win wonderful door prizes. Bouncy Castle Festival 2019 at Jean Marc Lalonde Arena in Rockland from 10am to 4pm. Come and have fun in an arena filled with inflatable bouncy castles!!! Admission is free but if you want to play you will need to purchase a bracelet. Bracelet will be good for the day! Mid-winter Challenge at Billings Estate from noon to 4pm. Team up with your friends and family to test your mental and physical skills as you explore the Estate in this self-guided challenge. Face off against a series of challenges inspired by 19th century winter life on the Billings farm to see if you have what it takes. Recommended for adults or families with children ages 10 and up (teams of 2 to 6 players). Cost: $6.50 single; $10.75 pair; $17.25 family. Animal Tracking on Snowshoes in the Gatineau Park at 1:30pm. What animal made these tracks in the snow? How do animals survive in the winter? Take a free guided snowshoe hike with a nature interpreter, and find out! Snowshoes are provided for this free, two-hour activity. Recommended for children of age 8 and older. Space is limited; reservations are recommended. Lace up your skates and come out to Rideau Hall from noon to 5pm, Rideau Canal or Sens Rink of Dreams! If you’re looking for an indoor activity, come out to the Nature Museum to the Butterflies in Flight exhibition where you will be able to see hundreds of live butterflies. Animal Tracking on Snowshoes in the Gatineau Park at 10:30am. What animal made these tracks in the snow? How do animals survive in the winter? Take a free guided snowshoe hike with a nature interpreter, and find out! Snowshoes are provided for this free, two-hour activity. Recommended for children of age 8 and older. Space is limited; reservations are recommended. Icecade on Sparks Street from noon to 5pm. Try your mitts at classic carnival games with a chilly twist. Enjoy a warm beverage as you lounge, toss, throw, or shuffle! The Big Bang Festival will be on at the NAC with tons of great activities (some $ and some free) for the whole family. The name says it all: the BIG BANG Festival will blow your socks off! The adventure features a performance by the NAC Orchestra, three virtuoso jazz musicians in an interactive and youthful take on Miles Davis, a dynamic marching band, a journey through all kinds of weird sound machines, and many other surprises. All of this energy at the NAC will put some much-needed colour into the winter doldrums. 26th annual Winter Garden Party from 11:30am to 2pm at Ron Kolbus Lakeside Centre (102 Greenview Ave.). With a variety of indoor and outdoor activities, this community event has plenty of entertainment for the whole family. Take an afternoon at Britannia Park to have some fun and connect with your community. Meet Elsa from Frozen at The Grand from 1 to 2pm. Meet and greet with Elsa from Frozen on the outdoor patio. Photo opportunities, fire pits, activities for the kids. They will have hot chocolate and seasonal beverages. Greater Avalon Community Association Family Fun Night from 6pm to 8pm in Orleans. FREE! Glow in the Dark Skating, Wagon Tides, Hot Chocolate, Taffy on Snow, Dollar Pancakes, Music , Camp Fire and much more. 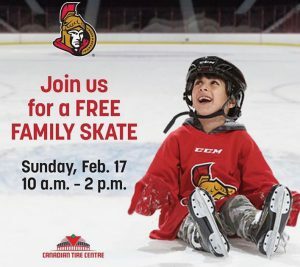 Free Family Skate at the Canadian Tire Centre on from 10am to 2pm. Family Day Bowling at Orleans Bowling & Stricker’s Billiards from 9am to noon. Come bowling to celebrate Family Day with your elected officials from Orléans, Andrew Leslie, M.P., and Marie-France Lalonde, M.P.P. Family Day at Goulbourn Recreation Complex from 10am to 3:15pm. On February 18, join us for a morning full of activities (including family fitness classes, Kindergym and crafts) and finish the afternoon with swimming ($) or skating! Family Day is full of fun at Goulbourn Recreation Complex. Annual Family Day Winter Carnival at Pushman Park from 10am to 1pm. 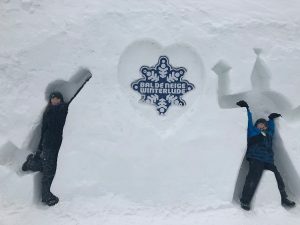 Activities include horse drawn sleigh rides, skating challenges, a camp fire, snow games and entertainment from Orbital Talent. There will be snacks for sale by our local 137th Scouts and Venturers. This event is free but bring some money for s’mores, hot dogs and chili. Monkey Rock Music Family Day Concert 2019 at Overflow Brewing Company at 11am or 3:30pm. Featuring original kids’ songs, children’s standards, and of course covers of modern and classic rock. The show is great for kids from the age of one to ten years old. Family Day at the Canada Agriculture and Food Museum from 9:30am to 4pm. 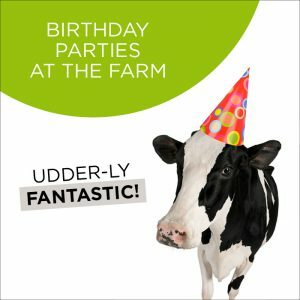 A unique family learning adventure awaits you at the Canada Agriculture and Food Museum! Explore the sights and sounds of farm life through animals, exhibitions, treasures from the collection, and hands-on demonstrations. Enjoy indoor and outdoor family fun on this special winter day. Don’t forget to stop by the Demonstration Kitchen to enjoy a tasty treat! 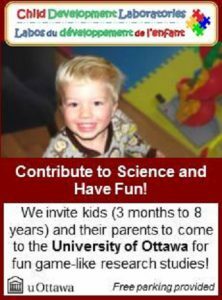 Family Day at the Canada Science and Technology Museum from 9am to 5pm. An exciting day of activities and demonstrations await you and your family. Exploratek: Motorized bricks, 9:30 a.m. – 4:30 p.m. Don’t just stack LEGO® bricks – power them up! Challenge yourself to build a contraption that lift weights, sets off a chain reaction, or rotates. Experiment with the endless possibilities of motion with LEGO® motors. Cryo-Genius demonstrations: 11 a.m. and 2 p.m. Packed with extremely cool experiments, this presentation observes the impact a liquid colder than ice has on technology. Pyrotechno demonstrations: 12 p.m. and 3 p.m. Discover the story of fire through some of the major fire-powered technologies. Accompanied by red-hot experiments, this presentation delves into how fire has powered innovation throughout the ages. SKY HIGH MAGIC SERIES – Mauril Bélanger Theatre—11 a.m. and 1 p.m.
PRINTMAKING WORKSHOP: CELEBRATING CANADA’S FIRST POWERED FLIGHT – 12:30–4 p.m.
KIDS’ TOUR: BITS AND PIECES, 11 a.m. BREATHING ON MARS, 11 a.m.